My ball my ball my ball!!!! 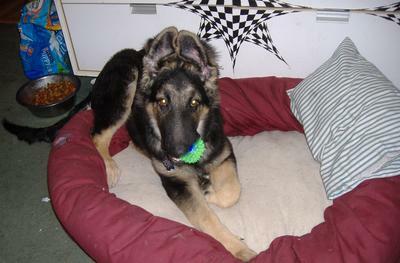 Hi all, the last time I wrote, I believe Ruger was a few weeks old. Well he is now 4.5 months old and 54 pounds, his paws are 3.5 inches across outside toe to toe, and legs (front) just about an inch below the elbow are right at 8 inches in diameter. He is 22 inches at his shoulders and his long hair is curly at the moment on top of his back. (he is a long hair GSD) His new found game with me is we hide a small tidbit of a treat in a snowball then throw it as far as I can (not that far). Tell him to "find it" and he just goes like crazy right to it usually. Being he cannot see where it lands due to all the snow, he has to use his nose. It is awesome and so much fun. He never wants to stop, my hands get cold and I have to call the game off first. But its a daily game now until the snow melts. I hope you like the picture, he also loves to find small treats in his bed. He is definately driven by his small treat tidbits (1/4" x 3/8") pieces enough to taste and want more. It's so nice to hear from you and to get the update on your little sweetie Ruger! 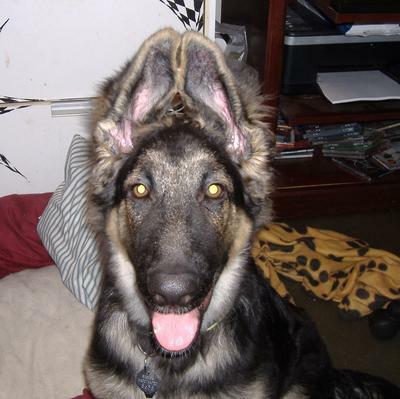 He is such a good looking German Shepherd puppy! I know you are proud of him. And I will have to remember your snowball game trick - that's a really good way to make him use that super sensitive nose!! I can think of a few ways to do that whether it's snowing or not. Thanks for the idea! Continued success with your GSD puppy, Ruger. And thanks for sharing him with us too. The pictures are great! 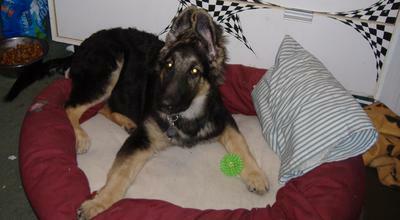 Comments for Update on My German Shepherd Puppy, Ruger!!!! Update on My German Shepherd Puppy, Ruger!!! He is a handsome pup! He is getting so big and strong. He looks like a ham and I'm sure he loves his picture taken. I hope his ear will be okay. Take care of your Ruger and he will take care of you. Thanks for the play tip. It's a scratch my head, "why didn't I think of that moment." Your puppy is great.